← Back To Full Employment, Losing the Demand Thing. Are We At the Completion of the Liberal Project? 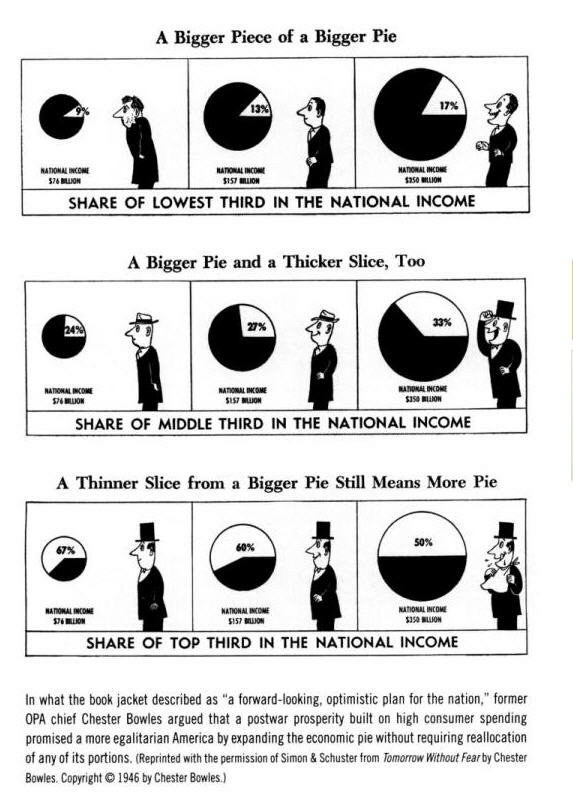 “A Thinner Slice from a Bigger Pie Still Means More Pie.” How different things are from 1946. – At a conceptual level, I don’t think the concept of liberalism is completable project. There will always be new things to debate. For instance, I consider Net Neutrality part of the project, a project where there is public access to a public sphere of speech, production and consumption that isn’t conditional on price discrimination. There’s is also obviously a lot that hasn’t been done, from carbon pricing to immigration reform to the military state to prisons, etc. But this conversation is on the liberal welfare state. The liberal vision of political economy in the 1940s rested…on the belief that protecting consumers and encouraging mass consumption, more than protecting producers and promoting savings, were the principal responsibilities of the liberal state. In its pursuit of full employment, the government would not seek to regulate corporate institutions so much as it would try to influence the business cycle. It would not try to redistribute economic power and limit inequality so much as it would create a compensatory welfare system (what later generations would call a “safety net”) for those whom capitalism had failed. It would not reshape capitalist institutions. It would reshape the economic and social environment in which those institutions worked. So that’s a two part description of the liberal state – #1 you would have the government maintaining full employment, empowering workers and giving them more bargaining power, and #2 you would have a safety net for those who fell through the cracks. I think it is safe to say that liberals have abandoned #1 and doubled-down on #2. The government can do things to make individual workers more productive, say investing in their education and health, but the government should not do things to explicitly give them more bargaining power. I agree with Kevin Drum that the moment this is abandoned politically a power imbalance grows, and it’s not surprising that you see stagnating wages and a public policy that is guided towards benefitting the richest. – I don’t believe that those two can exist without each other. Without a strong middle and working class you don’t have natural constituencies ready to fight and defend the implementation and maintenance of a safety net and public goods. The welfare state is one part, complimenting full employment, of empowering people and balancing power in a financial capitalist society. This is collapsing in real-time. One working definition of an approach to liberalism is “It’s best to just maximize growth rates, pre-tax distribution be damned, and then fund wicked-good social insurance with huge revenues from an optimal tax scheme” (Karl Smith, Wilkinson). I’d ask where are all these increasingly wickedly-well funded programs? We just had to bribe the top 3% with massive tax cuts for the next two years in order to keep unemployment insurance extensions in place for another year. Unemployment benefit extension are a net job creator and should have been a no-brainer, but it couldn’t pass without a massive bribe. This doesn’t include the brutal battle for extending health care to an additional 30 million+ people. This is even after the Federal Reserve created an alphabet soup of wicked-good safety net for the top 3% of the financial system, it’s difficult to get extra benefits for working-people in the largest post-war downturn. Public universities are being defunded at exactly the moment when people are most focused on a “polarized” job market and a lack of supply of high-skills. Jeffrey Williams asks us to consider student debt as a modern equivalent of indentured servitude, and I think the comparison is correct. – To me, the end result of having a safety net without giving workers stronger bargaining power is that what you end up with is a kind of pity-charity liberal capitalism. That’s better than nothing, but at the end it can be a dead-end, if the government doesn’t step in to fight for full employment. Particularly if you think of unemployment as a particularly scarring state of existence and, like me, think that the next major battlegrounds already are closer looks at production and the experience and conditions under which people work. 23 Responses to Are We At the Completion of the Liberal Project? Unionization rates are clearly part of the equation — e.g. a strong correlation exists between nations with high unionization rates and top-tier social safety nets (e.g. I seem to recall that over 30 percent of the labor force in Canada and Germany are members of unions). I also seem to recall though that France has fewer than 10 percent of its workforce unionized — yet it has one of the stronger social safety nets. Is this correct? If so, what accounts for the difference? Is this due to the sectors that the unions are located in (e.g. at pressure points in the economy), or is it due to the presence of state-run industries, or is there some other factor at play? The welfare state will be dismantled via the “pulling the ladder up”; ie, the GOP will decouple the middle-class style benefits received or expected to be received by people currently 55 and older, from everyone else. Terrified at the prospect of further cuts, seniors and boomers will side with the GOP since they are promising to protect their benefits, and slash everyone elses. And that is how liberalism and the middle class will die in America. In a sense, the “pulling up the ladder” analogy is a pretty powerful lens to understand what happened to the middle class in America. Basically every generation after the boomers has come to grips with the fact that the middle class dream is now out of reach, whether with respect to health care, education, jobs, or housing. Inequality will continue to grow as technology puts more and more people out of work. Given that trend, any humane program of liberalism must proceed towards a minimum basic income (see Phillippe van Parijs). Individuals should be guaranteed a minimum of food, shelter, education, information and communication technology, and health care. And even if you think scarcity or incentive issues make this liberal eschatology a pipe dream, at the very least some portion of the wealth of people with over $30 million in the bank ought to go towards making it a reality. Consider one factoid; India has 49 billionaires and 450 million people living in poverty. Unrestrained, America’s markets will eventually deliver similar results here. Good point. I think it is improbable that there is any way forward built on sheer nostalgia for the old New Deal or the labor movement – a labor movement C.Wright Mills diagnosed as being relegated to the minor leagues in the 1950s. To me, the end result of having a safety net without giving workers stronger bargaining power is that what you end up with is a kind of pity-charity liberal capitalism. Well put. The problem with the Yglesias/Klein/Chait argument is that it presumes that noblesse oblige is a perfectly satisfactory way of funding a social safety net. It isn’t. It’s patently OBVIOUS that it isn’t. And that means that distribution of income is something that liberals are going to have to confront. Meanwhile Australia has a $15/hr minimum wage and 5.2% unemployment. Ours is only $7.25/hr. Australia has roughly the same per capita GDP as us (and, conveniently enough, their dollar is trading at par with ours), if we had the same wage scale, unemployment would be no worse, poverty rates would be much lower and we’d be spending a LOT less on means-tested welfare programs (if a minimum wage worker gets a $4000 EITC credit, its like raising their salary to $9.25hr). The only people even in this zip code are the “Universal Living Wage” folks, who’d set the minimum wage by metro area (based on housing costs). Pingback: Collective Conscious » What Is ‘Full Employment’ Anyway? Pingback: Is there a cost of living crisis? « We are all dead.